Not to be confused with Premier of the Republic of China. The Premier of the State Council of the People's Republic of China, sometimes also referred to informally as the "Prime Minister", is the Leader of the State Council of China (constitutionally synonymous with the "Central People's Government" since 1954), who is the head of government and holds the highest rank (Level 1) in the Civil Service. This position was originally known as Premier of the Government Administration Council of the Central People's Government from 1949, (Chinese: 中央人民政府政务院总理) but changed to its current name in 1954. The Premier is formally approved by the National People's Congress upon the nomination of the President. In practice, the candidate is chosen through an informal process within the Communist Party of China. Both the President and the Premier are selected once every five years. The premier is limited to two terms, but the president is not. The Premier has always been a member of the powerful Politburo Standing Committee of the Communist Party of China. 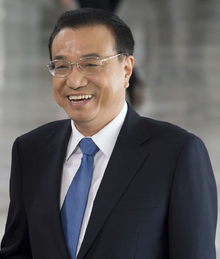 The current Premier is Li Keqiang, who took office on 15 March 2013. He succeeded Wen Jiabao. The Premier is the highest administrative position in the Government of the People's Republic of China. The Premier is responsible for organizing and administering the Chinese civil bureaucracy. For example, the Premier is tasked with planning and implementing national economic, social development and the state budget. This includes overseeing the various ministries, departments, commissions and statutory agencies and announcing their candidacies to the National People's Congress for Vice-Premiers, State Councillors and ministerial offices. The Premier's powers and responsibilities are codified into the constitution unlike the Prime Minister from the Westminster system as by convention or traditions. The Premier does not have command authority over the People's Liberation Army, but the Premier is the head of the National Defense Mobilization Commission of China and deputy head of the National Security Commission which are departments of the armed forces. Since the 1980s, there has been a division of responsibilities between the Premier and the General Secretary of the Communist Party wherein the Premier is responsible for the technical details of implementing government policy while the General Secretary gathers the political support necessary for government policy. In 1989, then Premier Li Peng, in cooperation with the then Chairman of the Central Military Commission Deng Xiaoping, was able to use the office of the Premier to declare war against Beijing and order the military crackdown of the Tiananmen Square protests of 1989. The Premier has been supported by four Vice-Premiers since Deng Xiaoping's reform in 1983. The First-ranked Vice Premier will act in the premier's capacity in their absence. For a more comprehensive list, see List of premiers of the People's Republic of China. ^ a b http://english.people.com.cn/constitution/constitution.html, Section 3, Article 88 and Article 89. This page was last edited on 3 April 2019, at 09:49 (UTC).